It’s been a busy few days at Tsubaki Grand Shrine. 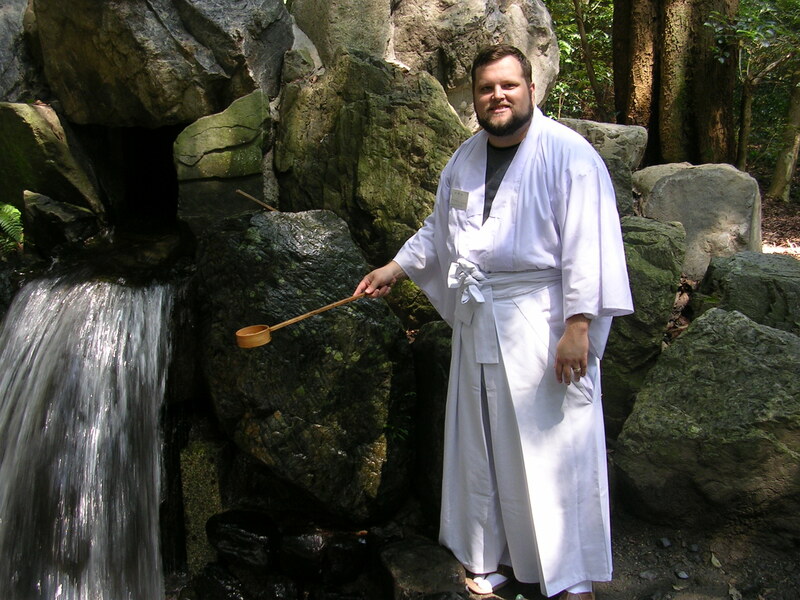 In my first three days here, I have been given Shinto priest clothing to wear, been introduced to the shrine’s ceremonies, and worn a loincloth while shouting at the top of my lungs and then standing under a freezing-cold waterfall. I’ve also eaten more fish than I have in years, and seen a beetle that was almost three inches long. More on all that later. It’s been a good time here at Tsubaki (which means “camellia,” if you were wondering). The historic Shinto shrine (some 2,000 years old) has been a faith partner with the Unitarian Universalist Association through the International Association for Religious Freedom for many years. Each year, the shrine welcomes several UU seminarians (and frequently UUA officials as well) to the shrine. I am spending two weeks here, learning from the priests, interacting with visitors, and immersing myself in the life of the shrine. Each day, I wake up and share breakfast with the staff at the kaikan, the shrine’s hotel. Then I work with the priests to sweep the gravel paths, clearing them of leaves before chohai, the morning prayer. The prayer, done in droning fashion by the entire community, is moving. You can feel the vibrations of the voices, and then the huge taiko drum starts. The middle of the day is mine to spend as I see fit, usually by walking around the grounds talking to visitors, at least those who speak enough English for us to have a conversation (which is many of them. I was surprised at how many Japanese have some fluency in English). I share lunch with the priests, miko-san (female shrine attendants and ritual dancers), and other staff. At the end of the day, we rake the gravel paths, something like making a huge Zen garden. Yesterday I got to do misogi, the ritual purification that culminates in a few moments spent with a huge amount of water, which is icy cold, spilling onto you from a waterfall next to the shrine. I’ll say more on this in a later post, especially if I have the chance to do misogi again. Today I observed a car blessing. Japanese people often take new cars to be blessed, so they will be safe for those traveling in them. Tsubaki, which is the shrine of the kami Sarutahiko-o-kami, is especially popular for this because this kami is associated with guidance and strength, two things you might want out of a car. In the ceremony, a blessing is said inside the Lion Hall, a small shrine at the bottom of the grounds, then the priest goes out to bless the front, back, and sides of the car with special river sand. There’s so much more to talk about, but it’s getting to be my bedtime. Life starts early at the shrine.